A feeling of incomplete evacuation, infrequent bowel movements and difficult-to-pass stools are all signs of constipation, according to Medline Plus. Gatrointestinal problems, such as constipation, diarrhea, abdominal pain and bloating, in relation to the consumption of specific foods often affect people diagnosed with IBS, or irritable bowel syndrome, or other gut disorders, but food sensitivities can affect anyone. Keep a food diary to help you identify the foods that seem to be causing your symptoms. Intolerance to nuts and their butters could be what is making you constipated, although peanut butter also contains nutrients that fight constipation. Peanut butter helps fight constipation as a result of its fiber content. Each 2-tablespoon serving offers 2.6 grams of fiber -- 10 percent of the daily intake for women and 7 percent for men, recommended by the Institute of Medicine. Because it loosens and softens your stool so it's easier to pass, fiber helps fight constipation. However, if you consume fiber-rich foods, like peanut butter, without adequate hydration, this can worsen constipation. Peanut butter contains moderate amounts of saliclylates and amines, which are natural food chemicals present in a variety of foods most people eat on a regular basis. However, if you are prone to gastrointestinal problems or are sensitive to salicylates or amines, eating peanut butter every day could lead to the buildup of enough of these natural food chemicals in your body to cause constipation or other symptoms of food sensitivities. This is explained in the "RPAH Elimination Diet Handbook," published by the Allergy Unit of the Royal Prince Alfred Hospital in Sydney, Australia. Peanuts themselves also contain the same compounds, and it is the peanuts with the skins that have the highest levels of salicylates and amines. Food intolerances are still under-recognized and not very well understood by most healthcare professionals. An intolerance to peanuts shouldn't be confused with a peanut allergy. A food intolerance doesn't trigger an immune reaction from your immune system, but it can cause different symptoms, including constipation, according to Food Intolerance Awareness website. People who react negatively to nuts by experiencing gastrointestinal problems often have trouble tolerating other types of nuts as well. Until diagnostic methods to identify sensitivity to salicylates and amines or peanut intolerance improve, the basic approach is to eliminate the suspected food from your diet and see if your symptoms improve. 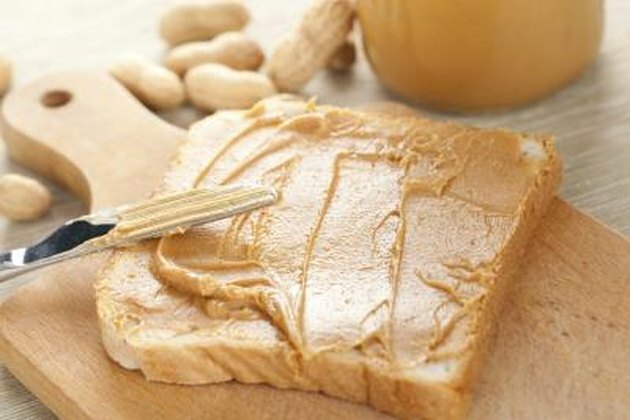 Eliminate peanuts and peanut butter from your diet for a period of six to eight weeks, a protocol suggested by the Allergy Unit of the Royal Prince Alfred Hospital. Avoid all foods containing even small amounts of peanuts to give a chance to eliminate the potential compounds found in peanuts and peanut butter that could be responsible for your constipation. If your bowel movements become regular while eliminating peanut butter from your diet, you will know that it was the source of your problem. After eliminating peanut butter and peanuts from your diet and relieving your constipation, you can try reintroducing other types of nuts or nut butter in your diet to test your tolerance. If you discovered that peanuts and peanut butter cause constipation while on your elimination diet, it may be best not to reintroduce them. If you really enjoy peanut butter, you could try to have very small amounts a few days apart to test your tolerance to moderate quantities. Otherwise, experiment with almond butter, cashew butter or other nut butter to see if you can consume them without experiencing constipation issues. Food Intolerance Awareness: Allergy or Intolerance?